Color Scheme 4: Pink Walls! 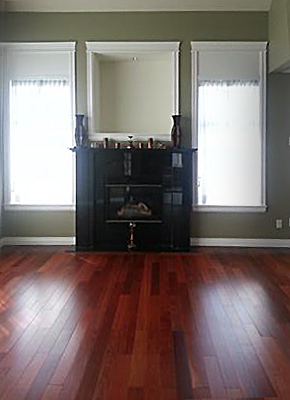 I have an open concept living/dining room with deep red cherry-colored hardwood flooring. I want to purchase a sofa set that has a silver frame and very light greyish purple fabric, and dining chairs with light pink fabric and silver frames. The rest of the furniture comes in a choice of silver and off-white or silver and black. The walls are in a light green that matches the cherry red hardwood. The baseboard and window frames are white. The fireplace is black. The entrance has dark brown-black tiles. with the cherry red hardwood floors? ♦ What's a good colour choice for the curtains? ♦ Shall I change the wall colour? ♦ Do I need to buy area rugs, and in what colour? I want to have an outstanding luxurious look to this open concept room. In principle, both pale purple and light pink can go well with cherrywood stains, but without standing in your living room and seeing these colors next to your cherry flooring, I cannot tell you for certain. If you're in doubt, I suggest you get large patches of the upholstery fabric (at least one yd², both for the chairs and the sofa), bring them to this room in broad daylight and ask a friend whose color sense you trust for their opinion. The exact hue/tone of your wall color will depend on the curtain fabric, which will first have to be matched to the upholstery colors. In other words, you may want to leave a decision about wall color until last. If you decide to go with green walls, you need to find a way to repeat the wall color elsewhere in in the room. One way to do this is to choose a curtain fabric that picks up your green wall color as well as the upholstery colors, and use this fabric for cushions and/or a throw (or maybe even a tablecloth). Another way to resolve the issue would be to buy a large area rug in a green that mirrors the wall color. This would help pull the entire room together, but it would also cover up some of that beautiful cherry floor. Big lavish flowers on a gorgeous quality fabric are a good way to create a luxurious, stylishly opulent look. I've used a Designers Guild fabric from their current collection for this example. I'm sure you can get similar (printed, woven or embroidered) curtain fabrics in your part of the world. Make sure the curtains and the pink/purple upholstery colors look great together from across the room. You need a fair expanse of matching colors: tiny bits of pink or purple in the curtain cannot create that effect because you don't see them from a distance. The quality of a fabric and the beauty of a print/pattern can make up for a lot of flaws in a room, and if your seating is all in solid colors you can afford to make the window treatments look special (as long as you repeat the fabric somewhere in the room). Another way to go is to keep the window treatments in simple white (this looks particularly good if you use a textured, scrumptious, substantial fabric). In this case you do want some pattern elsewhere to keep the room from looking too 'tame'. You could use a very elegant, patterned rug that picks up the green wall color, and/or green cushions in the same hue. Pale purple and green are not natural soul mates. Some look great together and others don't. It's best to pick a deep and slightly desaturated green (think lavender stalks). You also need a more feisty, deep rose pink that can stand up to the cherry wood floor color in this combination. Best complemented with a deep bottle green and a vivid pink! I'm going to go out on a limb here and suggest a pink wall color - somewhere between terra cotta and candy - as an alternative to green. This would give you a very 'Italian' look for the room, and you could complement it with curtain fabric in vivid, even edgy, contemporary colors. Obviously, I have no idea if this goes with your furniture, but I thought I'd put it out there. I wish you the best of luck with this gorgeous room! While working on this article, I found out that Ann had resubmitted her question with several added photographs. And it turns out her 'grayish purple' looks quite different from what you see on this page. It's really, really pale! Check it out here. here's a third vote for the classic! I like the idea of a 'lavender field' color scheme and I think it would look very good with that cherrywood floor! In fact, I'm gonna try that out myself! Thanks for the ideas! Oooh I love that first version best, those roses are really fab. I think I would make the curtains a bit more of a grand affair, actually! Join in and write your own page! It's easy to do. How? Simply click here to return to Color Questions - Interior.